Chances are, if you have been following this blog for a while, you would have heard me talk about how you achieve your goals though your position-sizing model (Hat tip to Van Tharp). That’s all well and good, but how exactly do you go about constructing your position sizing model to do this? For example, I had a gentleman email me (who inspired this post) wanting to know how to build a position-sizing model that returned 25% a year, with a maximum drawdown of 10%, using the FX Renew signals. You can set your goals as low or high as you like. What’s most important is that you can identify them to start with. I recently built what I call the 5&15 position-sizing model, to be used with the FXRenew signals. As the name suggests, it has a targeted return of 15% a month with a maximum drawdown of 5%. Tip: When you are setting these goals, make your risk/reward asymmetrical. I.e. have the return goal (much) larger than the drawdown goal. This means your returns will be skewed in favour of the upside and your risks well constrained. Next, you need to have an idea of the results your system produces in terms of how many trades it will produce and how many wins vs losses it has. You also need to consider your biggest likely losing streaks, and how much profit you can expect to make per trade. They make on average 2.4R per winning trade (So if you risked $100 on a trade, you would make $240). Largest losing streak is 3 trades in a row (As the signals are new, I expect the losing streaks will end up being larger than this in time). Note: Please take these numbers with a grain of salt. I expect them to change as we add more signals to the mix. Our sample size is relatively small at the moment. Just to give you an idea of what this means, if you did 10 trades risking $100 and got the above performance, you would have made a profit of $460 or 4.6R. For those who want to get technical, this is an expectancy of 0.46. For each trading you place, you can expect, over time, to make 0.46R. Tip: You don’t need to include every trade the system generates in your position-sizing model. Now you know your goals, and your system’s expected performance, how much should your position size be? Once you have established your goals, and you know what you are going to get from your system, you can start to work out how much you should risk on each trade. Your position size is then determined by how much you risk on each trade. If you are risking $100, or 1% of your account, you need to determine the size you should trade based on when you are putting your stop loss. Might sound tricky, but it’s simple in practice with the right tools, like this MT4 trade manager. This step takes some trial and error, so let’s work though an example together, using the annual target of 25% with no more than a 10% drawdown combined with the signals. Firstly I am going to narrow things down by making some assumptions. I know that on average I am going to make 0.46 of my risk per trade, so if I am placing 10 trades a month risking 1%, I am going to make 4.6% a month, or 55% per year – roughly twice our target. This means we can afford to trade smaller: 0.5-0.6% per trade if we want to trade 10 times monthly and still reach our goal. If we are looking to take more like 20 trades, we can trade as small as 0.3% on average. Let’s assume we want to trade 20 times a month, based on a starting balance at the beginning of the year. Rule #1: I will risk 0.3% of my starting balance per trade (my account balance at the start of the year). As I am looking to limit my drawdown to a maximum of 10%, I know that I will need to decrease my position size if I start to have a drawdown. As I am risking only 0.3% of my starting balance, it will take me 15 losing trades in a row even to get to a 5% drawdown. But, to be on the safe side, if I do go into a drawdown of greater than 5%, I am going to decrease my position size by 50%, until the drawdown is recovered to less than 5%. This creates both a financial and psychological safety barrier to escalating mistakes, which is a good rule to have in place. Rule #2: if I have a 5% drawdown, I will decrease my position size by 50% to risk 0.15% of my account starting balance per trade. If things go well, you can usually also decide to increase your position size. In this case, though, it is not part of my objectives, so I will keep my risk at a flat 0.3% if I am making profits. So that’s it; my position-sizing model in this case is made up of two simple rules. I will risk 0.3% of my starting balance per trade, 20 times per month. I can reasonably expect to make 0.46R over time, but in the unlikely event of a drawdown greater than 5%, I will halve my position size until I am back over that threshold. Once you have developed your position-sizing model, it is time to test it. You can do this via demo trading, or live trading if you like to have skin in the game, but a very good way of testing it is by using Van Tharp’s position-sizing game. In this game, you can define the system’s inputs, and your position size, and see if your model achieves your goals. You can also add in settings for mistakes and costs, to make it more realistic. You can see I achieved the goal in 153 turns (that is 153 trades), with a maximum drawdown of 10R or 3%. This position-sizing model achieved its goals, but we can draw a few conclusions from the test. I could most likely reduce my position size, and my drawdowns, and still achieve this goal. I had placed 153 trades out of a potential 240. I could look to place less trades a month (around 15) and still hit or be close to hitting the goal. If I am comfortable with the risk, and still want to take 20 trades a month, I could increase my annual target comfortably. If I wanted to make any changes, I would then run the test again to see the results. You probably want to run it a few times anyway, just to get an idea of the effects of natural variance (I ran it twice and got pretty similar results). 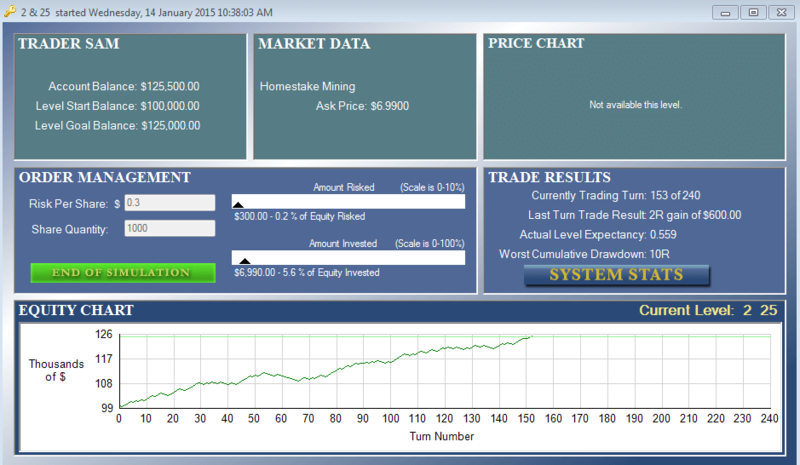 Note: In the real world trading does not perform like a simulation so take any simulated results as indicative only. When you are trading notice your performance vs. your predicted performance and be prepared to adapt depending on what is happening in-front of you. To achieve truly superior profits, you need the courage to risk some of your gains. You can scale-up your positon sizes quite dramatically when you are in profit. If you are well attuned to the market, you might want to gradually increase your position size. When you are on form, you want to make the most of it. The reverse is true when you are trading poorly – time to scale down your trade size. If you are scaling in to your trades, you might want to risk some of the profits on the trade to trade a much larger size. A lot of good traders will trade larger sizes for high conviction trades, and smaller sizes for lesser conviction trades. This is very important, and is not done by most retail traders. You might want to trade different sizes based on whether your trades are short-term or long-term. You need to know what to do once you have hit your goals. Do you stop trading? Do you go for a big year or month? How will you recover from drawdowns? If you are trading smaller, it is going to take more time to recover. When will you start to increase your position sizes again? I am sure you can come up with more to add to this list. As you can see, position sizing is a big topic (excuse the pun). Hopefully you can see now the process that you go through to build a position-sizing model that achieves your goals. There are more lessons on position sizing in the Advanced Forex Course for Smart Traders, and the Mastering Signals Lessons as well as some custom-built position sizing algorithms. The post The Nuts and Bolts of Constructing a Position Sizing Model to Achieve Your Trading Goals appeared first on www.forextell.com.